This room is named after the graceful forty year old Globe Willow tree standing just a stone's throw away from the front door. It adjoins the Ivy Cottage, with a shared porch and its own separate exterior entrance. 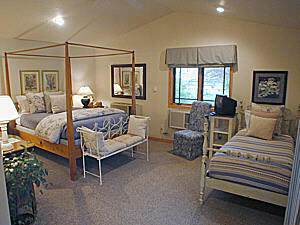 The Willow Cottage is a beautiful spacious room with a pencil-post pine bed. Rockers are waiting on the front porch with restful views. The Willow Cottage hosts the amenities of private bath with whirlpool, day bed, small television with VCR, access to video library, wireless internet, in-room telephone and a small refrigerator.